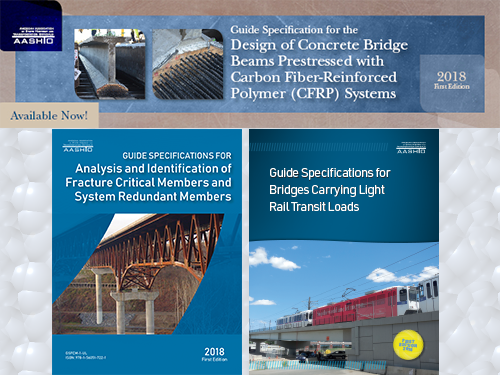 The American Association of State Highway and Transportation Officials recently published three new “guide specifications” that focus on specific aspects of bridge design and construction. The first is “Guide Specifications for the Design of Concrete Bridge Beams Prestressed with Carbon Fiber-Reinforced Polymer Systems, 1st Edition,” which addresses the design of prestressed concrete beams constructed of normal weight concrete and those prestressed via CFRP systems. The second is “Guide Specifications for Bridges Carrying Light Rail Transit Loads, 1st Edition,” which serves as an “introductory supplement” to the AASHTO LRFD Bridge Design Specifications that focuses mainly on bridges subjected to light rail transit or LRT loads alone, yet also includes information on bridges carrying both LRT and conventional highway traffic loads. Finally, the “Guide Specifications for Analysis and Identification of Fracture Critical Members and System Redundant Members, 1st Edition” delves into the critical role fracture critical members or FCMs play in bridge construction; items defined as steel primary members, or portions thereof, subject to tension whose failure would probably cause a portion of or the entire bridge to collapse. AASHTO noted that the decision to designate members as FCMs has often been made without considering actual system redundancy or performance of the structure and that, prior to the development of these guide specifications, no standards existed on how to best conduct analysis and response to an FCM failure. The group stressed that those assessment procedures apply to typical steel bridges, including simple span and continuous I-girder and tub girder bridges, through-girder bridges, truss bridges, and tied arch bridges.